With so many ways to connect in our communication-obsessed world, the casual kickiness of slang creeps into daily life via many avenues. Laid-back lingo fills text messages, blog posts, Tweets and emails, as well as conversation. Who has time to pen formal prose in an e, even to the boss? LOL! But where do you turn when you come across an unfamiliar term? Asking someone might mark you as hopelessly unhip. Essex author Mary Elizabeth has crafted a handy and entertaining solution: Barron’s American Slang Dictionary and Thesaurus. Elizabeth privately calls her hybrid reference guide a “dictionasaurus.” It defines words and phrases and provides synonyms for them. The project took Elizabeth nearly five years from conception to publication. The freelance educational-product developer has written other language-related books — on poetry, spelling and speech — for Barron’s, a large publisher of instructional titles. What inspired her to devote so much time to the seemingly arcane pursuit of compiling a nearly 600-page reference tome? “With the physical book,” Elizabeth continues, “there are some things that are just different.” She gives the simple example of being able to stick a finger in one section and flip back and forth to another. This old-fashioned browsing allows the reader to explore and find patterns not visible when scrolling or clicking in an electronic format — and to stumble on some wild expressions by chance. “A flea short of an infestation” means unintelligent, FYI. 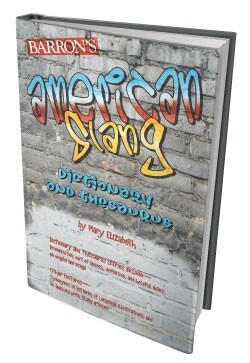 Barron’s American Slang Dictionary and Thesaurus by Mary Elizabeth, Barron’s Educational Series, 596 pages. $14.99.